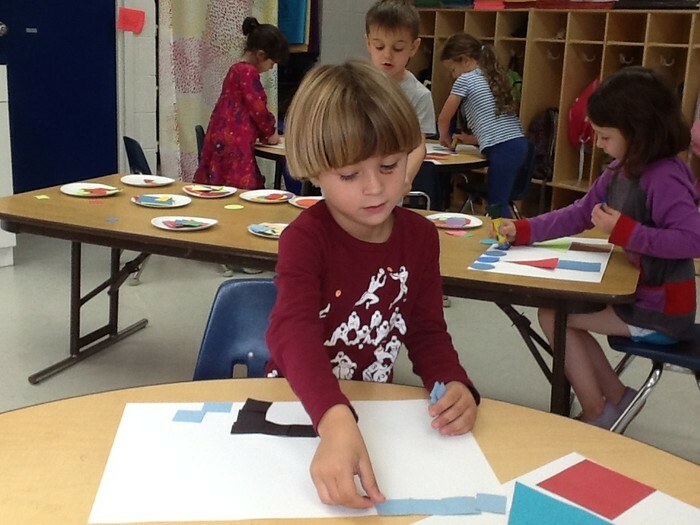 As the leaves begin to change, we are talking a great deal about colors in Kindergarten. 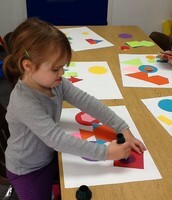 We read a story called "Color Shapes" by Ellen Stoll Walsh. After listening to the story the children were invited to select any shapes and colors they liked from a color/shape "buffet". Then the real fun began! 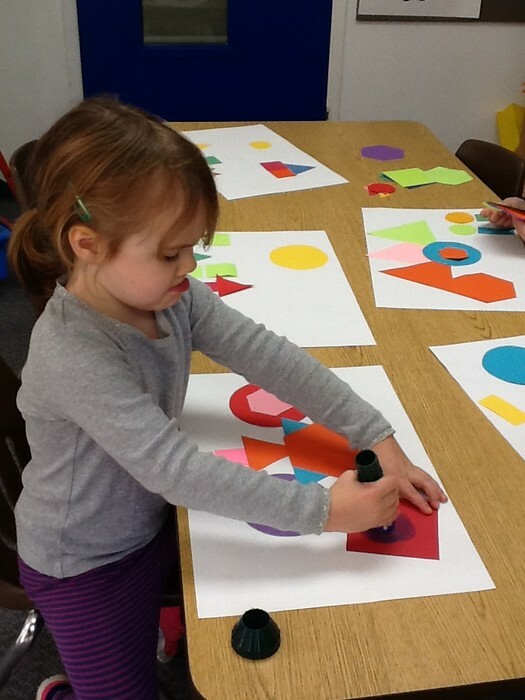 We could see the creative brainwork at play as the children thought of what sort of picture/collage to make from their shapes. We are looking forward to showing you this riot of colors and shapes at conference time later this month. In Math we continued our pattern search and followed a simple recipe to make a delicious Number Salad. 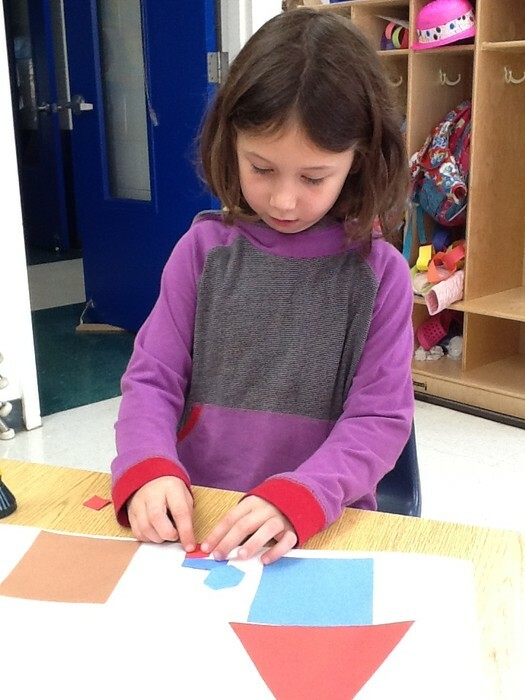 We are experimenting with Seesaw, our online portfolio. If you've not done so already, please take a minute to register with Seesaw. The children used their iPads to take pictures of the beautiful self portraits they made at the start of the year with Mrs. Bennett in Art class. The children made an audio recording of their thoughts and ideas as they relate to the portraits. 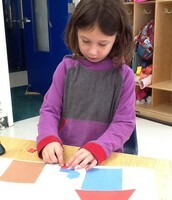 Also, the children recorded themselves "reading" the wordless stories they created last week. We look forward to sharing these books and recordings with you at conference time. * Can you remember some of the ingredients we put into the Number Salad? * What was the little red house with doors, no windows and a star inside? How do you find the star? * What did you do with a red square? * Follow a simple recipe and make a treat with your child. * Read the poem of the week - "Apples." *Parents! On Friday, November 13th, Kindergarten will be performing the Left-Right song and a folk dance at our Morning Meeting. We look forward to seeing you there! * Fall weather is on its way. Please be sure that your child has appropriate clothes for the weather. Also, we would be ever so grateful if you would teach your children how to zip up their coats. We need all the "zipper-uppers" we can get! Of course, we are always available to zip up anyone who needs the help. Poem of the week: "Apples"
Executing a plan of her own.